Bertrand Hug’s airy, open eatery offers a panoramic city view with a casual-chic, romantic ambience and fine modern French cuisine. Expensive. Sunday 2:30-6pm: $5 draft beers, $5.50 craft beers, $6 sangrias. Served at bar or patio only. Monday 2:30-6pm: $5 draft beers, $5.50 craft beers, $6 sangrias. Served at bar or patio only. Tuesday 2:30-6pm: $5 draft beers, $5.50 craft beers, $6 sangrias. Served at bar or patio only. Wednesday 2:30-6pm: $5 draft beers, $5.50 craft beers, $6 sangrias. Served at bar or patio only. Thursday 2:30-6pm: $5 draft beers, $5.50 craft beers, $6 sangrias. Served at bar or patio only. Sunday 5 p.m. to 10:30 p.m.
June 12, 2008 @ 7:23 p.m. I sat on the patio this past Monday with my business associate and a client and had a very pleasant experience. 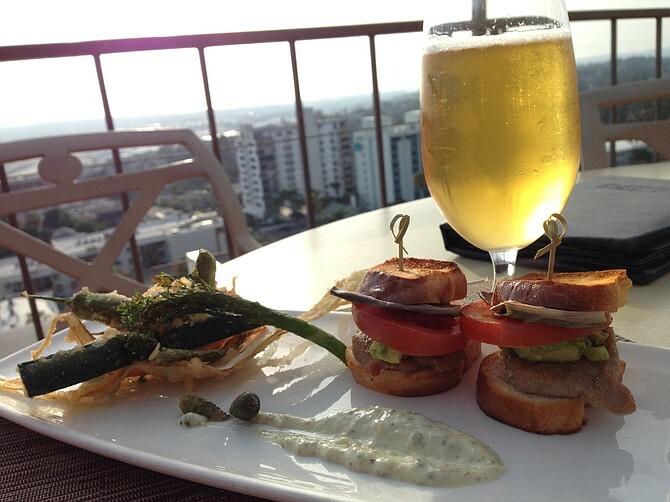 I frequent Mr. A's for business diners but enjoy sharing appetizers and drinks on the patio even more. I would recommend the chioppino style mussels and prawns. Also, our server was excellent. There was one girl amongst several male servers and bussers- I would seek her out and make sure she serves you (I think her name started with an A). She was clearly happy to be at work and was enthusiastic about the food- making it all the better and paid close attention to detail. Mr. A's is still great! Aug. 11, 2008 @ 1:49 p.m. I have dined here several times a year for a long time and am very familiar with the establishment. The food is always good and the atmosphere appropriate for the fanciest of occassions or business. However, I dined here last week and had the RUDEST busser I have ever had and a mediocre waitress. The busser was clearly not amused by the smallest of requests I asked of her and as she walked away I heard her swearing under her breath and then saw her talking to the waitress and looking over at our table in a completely inappropriate way. She ruined my ability to enjoy my meal and made me feel very self conscious about my needs, such as being out of water and needing dessert settings. I was really irritated and don't know how a place like Mr. A's continues to employ a girl who can't stand working in a restaurant. Jan. 23, 2009 @ 6:25 p.m. The Animal Protection and Rescue League asks you to boycott this restaurant to help stop animal cruelty. Mr. A's continues to serve fois gras, the liver of ducks or geese which have endured weeks of force feeding, performed by jamming large metal pipes down their throats and filling them with massive quantities of food. This is the equivalent of forcing a 150 pound human to eat 60 pounds of food per day. The livers of these poor birds swell up to ten times their normal size, inducing a disease called "hepatic lipidosis". These fattened, diseased livers are served as foie gras. Please call Mr. A's and inquire if they are still serving fois gras. If so, then please let them know that you choose not to patronize restaurants which engage in this horrific cruelty. Your call will make a difference! Jan. 27, 2009 @ 3:43 p.m. The way Mother Goose and Mother Duckie feed their young is by jamming their bills down their open mouths and regurgitating digested food into their throats -- in short, gavage with a bill instead of a funnel. A friend of mine did a stage at a Perigourd goose foie gras farm; when she came back, she reported that the geese (hardly cuddly critters) would crowd around Mamere, pushing to be the first to jump into her lap for the feeding. Cruelty? Apparently not to the birds. Also, in the wild, just before migration, ducks and geese forcefeed their own selves, eating orgiastically until their weight shoots up and their livers swell -- their own way of making sure they have enough fuel stored up to fly thousands of miles south. Foie gras is far from the cruelest food. An ordinary "factory chicken" probably has a far worse life. What you Animal Rights militants really want is to prescribe a pure vegan diet for humanity. You wanna be vegan? Help yourself. Don't oppress me with your sentimentality. Jan. 29, 2009 @ 4:20 p.m.
Naomi: I believe that most people who eat meat want the animals they consume to have been raised and killed humanely. Perhaps this is the case in that small village in France, but this is not the case with large-scale factory farming in the United States. Those who make the choice to eat meat should look at the reality, not an idealized vision they hold in their heads. To image that all animals that make it to the plate have had a good life and painless death is delusional. Short of visiting a factory farm, an animal auction house, a slaughter house, and meat-packing plant, at least check out: http://www.hfa.org/about/index.html. There's nothing wrong with caring about the suffering of others, whether they are people or animals. Jan. 29, 2009 @ 8:06 p.m.
Jan. 30, 2009 @ 12:03 a.m.
Dear udaj: As a “true lover of God’s creations”, you are remarkably callous to the suffering you cause when you order fois gras. Are there no limits to the intensity or duration of pain and illness that you would have these birds endure so that you might find their diseased livers a bit more pleasing to your palette? Does their suffering matter to you not in the least? And please don't try to justify this cruelty as a tradition. We have many fine traditions, such as crucifixion, burning witches at the stake, and dog fighting which we (most of us, anyway) consider barbaric. The fact that our ancestors often committed evil acts does not give us an excuse to do so. I think Gandhi said it best: "The greatness of a nation and its moral progress can be judged by the way its animals are treated." Jan. 30, 2009 @ 1:11 a.m. The starving dog at his master's gate Foretells the ruin of the state.